Each installed theme can be "inspected." This provides an overview of exactly which page templates the theme includes, and the files each maps to in the theme's folder. If you're curious how your theme works, this is a good place to start snooping around. The Inspect page is also where one can install new page templates. 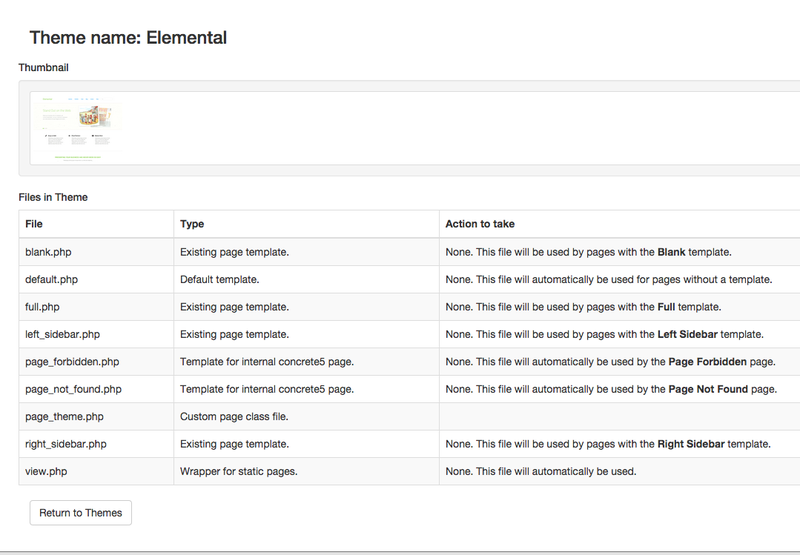 If your theme was not set up to install its custom page templates automatically, you will need to install them from the theme's Inspect page before using them. Notice that other themes in my site have already registered page types with the other handles: full, left_sidebar, etc. But the three_column handle is new and not already in use. To install it, make sure the checkbox next to "Create page template" is installed and click OK. Your page template is now ready to use! One thing to keep in mind, though, is that the page we're working with will need to use our current theme in order to see my new Three Column page type; other themes without a specified page template with that handle will use their page template with the "default" handle as a fallback.